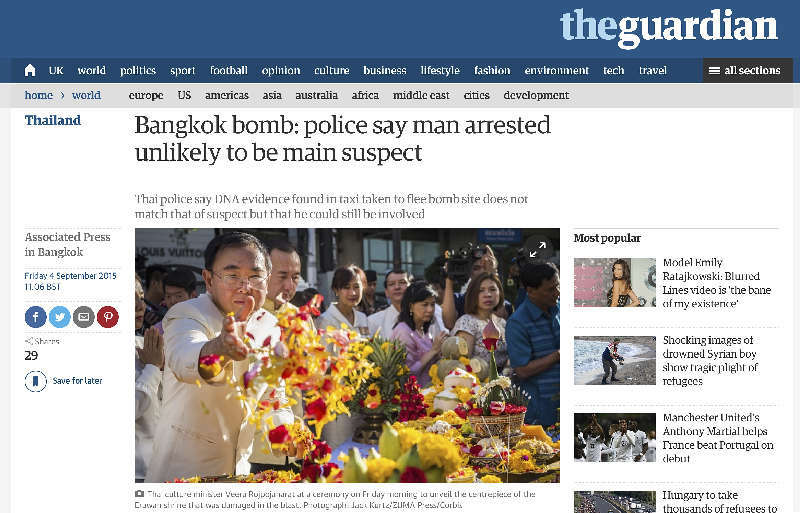 My photo in the Guardian (UK) used as the main photo for an update on the manhunt for the Erawan Shrine bombers. A few minutes after I made it, I processed this photo on my iPhone and sent it to ZUMA. I would have missed the Guardian's deadline if I had waited to edit until I got home. Although I do work similar to what wire service photographers do in Bangkok, I am not a wire service photographer. I send photos to picture agencies and clients, usually on deadline but not on such tight deadlines that I have to carry a laptop with me when I'm on the street. I normally have the luxury of going back to my home/office and editing on my MacBook Pro Retina and the array of external drives I have hooked up to it. Wire service photographers work on very tight deadlines. Most of them carry their laptops with them everywhere they go. When there's a break in the action, they open the laptop edit a couple of photos and send them. There are times though that I have to work on tight deadlines, when I'm competing directly with the wire service photographers and I don't have the luxury of going back to my home/office to edit. 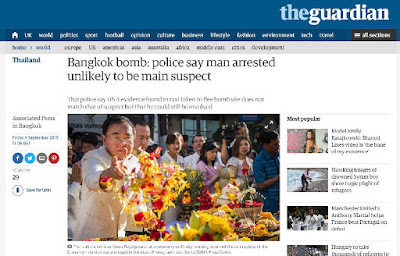 The recent bombing at Erawan Shrine is the best example of one of those times that I had to work on wire service deadlines. For those times, my iPhone is a nearly perfect tool. The browser in Photogene2, the main app I use for processing and transmitting photos. It hooks into the photo library (called the Camera Roll) on the iPhone. 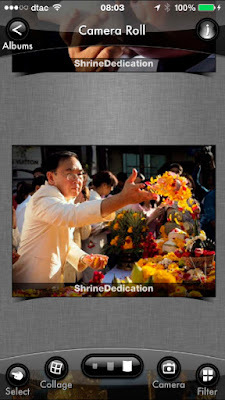 That's what I did after the rededication ceremony of the Erawan Shrine. After I photographed the ceremony, I went to a local coffee stand, took a seat in a corner, copied some of the morning's photos from my cameras to the phone, edited them on my iPhone and sent them to ZUMA. When I finished editing, I walked back to the shrine and made a few more photos of regular people praying. People have been using smart phones to file photos for more than a decade but until relatively recently it meant emailing a photo to an editor or someone else who then toned and edited the photo, wrote the caption and dropped the photo into an archive. The iPhone and the Olympus Micro 4:3 gear have given me a tiny powerhouse with a set of features that lets me submit fully finished photos to a client and work with a fraction of the gear the full time wire service photographers use. This is not a perfect workflow. The iPhone doesn't have the horsepower to quickly process raw files, so I'm working with JPEGs. Editing photos on an uncalibrated iPhone screen, making adjustments to color and exposure, is difficult and writing captions on the iPhone's tiny screen with a "keyboard" that takes up much of the screen real estate is tricky. It's a set of compromises, but it works well enough for the number of times I need to do this. Editing with Photogene2 on the iPhone. Photogene2 has most of the tools editing applications, like Photoshop and Lightroom, have on full sized computers. The smaller screen and touch interface mean you have to rethink your workflow. Now I'm working with Olympus Micro 4:3 cameras, mostly the OM-D E-M5 Mark II but also the E-P5. These cameras have built in wifi. When I'm working on tight deadlines (or when I'm Instagramming), I send the photos from the cameras to the iPhone using the wifi. 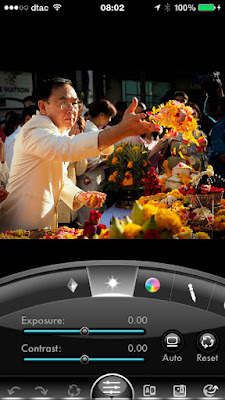 I edit the photos in Photogene. The Olympus cameras generate very nice JPEGs, so I do only a little editing because it's much harder to see what you're doing on the iPhone and there is no always visible histogram in Photogene like there is in Lightroom. And I always, always edit using the histogram when I'm working in Lightroom or Affinity Photo, my Photoshop replacement. I caption using Photogene's IPTC tool. This is the hardest part of the process because the IPTC window completely covers the photo and I can't see what I'm writing about. On top of that, literally, the iPhone keyboard covers up a good portion of the IPTC window. The IPTC window, with keyboard not on the screen. The keyboard fills the bottom 1/3 of the screen. 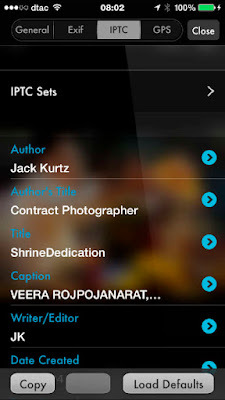 When I'm done writing the caption, I export the photo using Photogene's built in ftp tool. It's not a perfect setup, but it's a very good one. I only have to do this once a month or so, when I'm on a story that requires immediately transmitting photos. What would make it better? It would certainly be easier to work on an iPad. The iPad has a bigger, better screen and so everything would be much easier on Apple's tablet. I don't have an iPad and I don't see myself getting one. If I had to do this every week or a couple of times a week, I would probably get an iPad or iPad Mini. If I had to do it everyday I would probably consider an 11inch MacBook Air, which is not much bigger than an iPad Air for carrying around but offers full photo processing with Lightroom, Capture One or the software package of your choosing. But for now, knowing that I can use my iPhone to file pictures minutes after they're made, the iPhone and wifi enable M4:3 cameras are all I need.